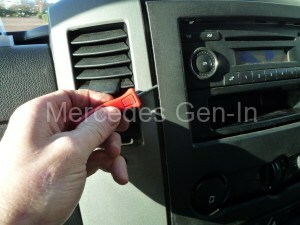 Removal of the integrated radio/CD Player from the later model Mercedes Sprinter (NCV3) and VW Crafter models is quite straight forward and easily carried out with the minimum of tools. 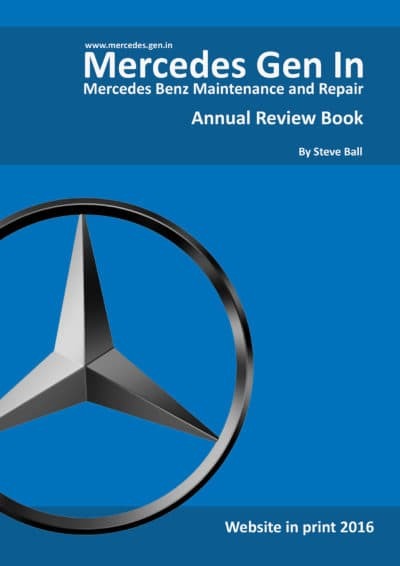 Although this post will primarily covers the removal of the OEM radio, removal of several other dashboard components is also documented, these were required to gain access for the installation of a fleet vehicle tracking system. 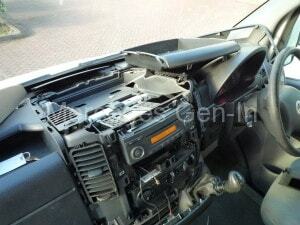 As you can see the original display to this HA1111 Sprinter radio had been damaged, I was unable to find the replacement parts to carry out a repair to the LCD so an alternate method of repair was chosen. As you will be aware the HA1111 radio is protected with a ‘PROD’ security feature and in many cases coded via CANBUS to the vehicle ECU. To get around this problem a replacement radio was purchased from EBay for a bargain price of £35. It did not matter that it would be coded to another vehicle, all I required was a radio of the same model and version to swap the damaged front panel containing the LCD display unit. In doing this the radio coding issue would not be a problem as the original chassis (that worked perfectly well) would be retained and just swapping the front panels in this case was a perfect economical solution given the type of fault. 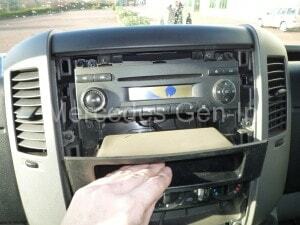 Firstly prize off the console bezel that surrounds the heater, storage tray and radio. Insert a blunt object into the trim gap in the lower and upper corners of the bezel and lever it forward – it is fixed on clips. once the upper and lower corners are free, lever between the central heater control to release the middle section clips. Pulling now from the top, carefully release the bezel from the centre console. Once it is totally free from the retaining clips, remove the electrical connector plug from behind the hazard warning switch and place the bezel safely out of the way while you proceed to remove the radio. 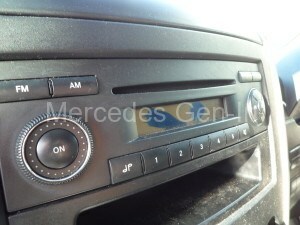 The radio is simply held in with 4 torx screws, one at each approximate corner location. 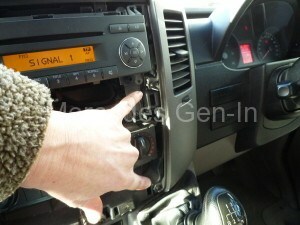 Once these are removed the radio can be slid out of the dashboard. There is a slide rail arrangement moulded into the inner dash frame that guides the radio into position and secures its location. 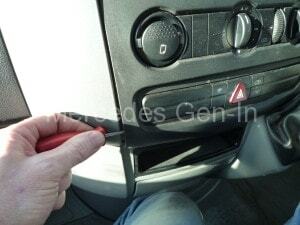 You will have to remove the lower storage tray beneath the radio first, not only to gain access to the radio lower fixing screws but to prevent the wiring loom being caught behind and preventing full radio removal – this is removed easily with a ‘straight pull’ outward. Once the radio is removed, it can be unplugged from the ISO connector loom and coaxial antenna disconnected. 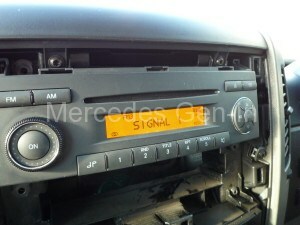 You may wish to read a little more on the Mobis HA1111 Mercedes OEM radio and its features here and here. 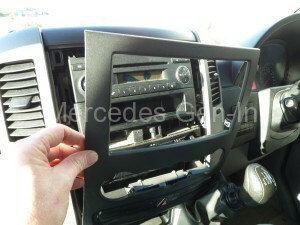 The dashboard corner speakers are accessed by prizing up the leading edge furthest away from the windscreen and lifting this edge upward and out. The centre speaker can be accessed in the same way by lifting first the corners, then the middle of the long edge of the square central grille. If you wish to remove the top storage tray section, undo the 2 torx screws in the front lip of the upper section directly above the radio. Then undo and remove the 2 vertical torx fixings from each grey console/vent side section, this plastic trim pulls straight out towards the passenger compartment. Once each side is removed it will reveal 2 more screws on the top, that once removed will allow full removal of the top tray and lid half-section. 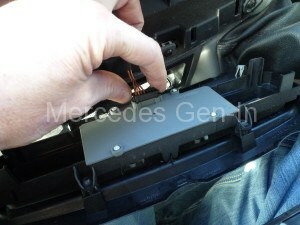 In this case the under-tray section was used to mount the hidden GPS antenna. 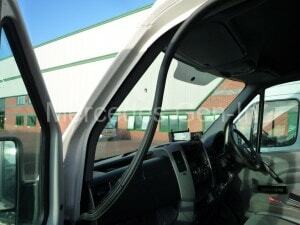 The tracker GSM antenna was mounted in the windscreen side pillar. This is simply removed by pulling free the door seal and then prizing inward the 2 trim clips that support the door pillar cover trim. Pulling the top is the best way to proceed, levering out the trim as you work down to the dash. Once free, flip out the speaker grille as above and pull slightly upward on the trim piece to unlatch the single lower tongue, it can now be fully removed. Any wiring that may be needed to be run from the centre console/radio can be routed down through the heater console area and run beneath the glove box to the door pillar. The glove box is removed by opening its door and pressing inward the 2 sprung plastic tabs that form part of the rear tray moulding. 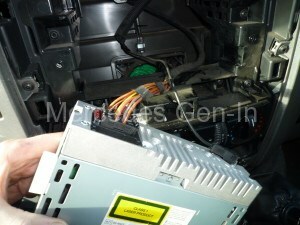 This allows the glove box to fall fully forward, revealing a further 3 torx hinge screws. These screws will release fully the glove box so that it can be removed from the dash. however I have a box sprinter so no antenna on the roof, where will I find it? Have a look in the box over cab section, often the antenna is rigged inside it as if fibreglass it does not effect radio reception too badly. You could fit a new antenna inside the fibreglass front box or fit an antenna on the near side wing – running new cable through the bulkhead grommet behind the battery into the cab to the radio. You should have both permanent and ignition switched battery + connections at the original radio connector. You may have a blown fuse if you cant measure it at the connector. The L/H side has: unused, Black, yellow then thick brown (earth). The B bank has 4 connected pins (top bottom pairs unused) which i assume are the speaker wires. I don’t seem to have any permanently live +ve feed. Any further advice welcome! Use the below for guidance only and always double check what you have with your test meter before connecting anything! Your model could be different! A rather strange request from a very non-audio person. 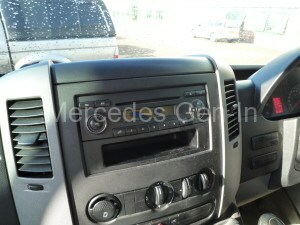 I would like to play MP3 in my Vito – ideally direct from my phone BUT I do NOT want a radio in the car. 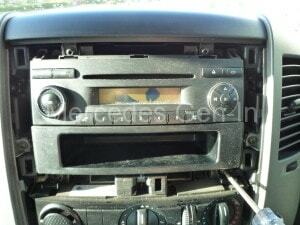 Could I perhaps just install an amp into the appature for the radio and hook my phone to it? Yes that is entirely possible. What I would do is look for a suitable Bluetooth speaker (many shapes and sizes available) even better if you can get one that takes a 12v external supply. Chosen wisely this would be the ideal solution as there would be no wires between the phone and amp, a few of these units also have a speaker phone option and may be able to be used as a hands-free device. Particularly the Sony BT speakers have NFC that associates directly with the phone (if it is a NFC compatible handset) on proximity – no setting up at all, they just work! 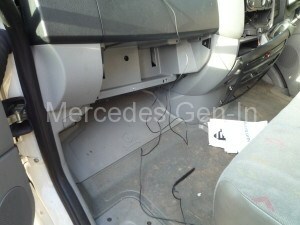 The speaker could be placed/fixed in a convenient area in the car/van without much issue. The output volume is very respectable in most cases. I would just mount a standard cheap telescopic whip antenna somewhere behind the box bubble, this would provide adequate signal as the bubble front is often fibreglass and presents little barrier to radio signals.